Medreto Ltd was established in 2007, inspired by innovations in medicine and with purpose to represent in Estonia and neighboring countries manufacturers, who provide innovative, less invasive medical solutions and to train medical personnel. As an important trend, we see the development of a credible international cooperation in between of recognized manufacturers in the medical field, professional experts and healthcare professionals. Our strength is a competent team, professional customer support and 17 years of experience in the medical field. Medreto Ltd main customers are the hospitals and health care institutions in the Baltic States. We offer products from the leading manufacturers of medical equipment, including Radiology, Cardiology, Neuroradiology, Endovascular and Surgical specialties. Customers needs and patients safety is important to us. Highest quality at every level – in products, relations, service and agreements are values that guide us. Medreto team constantly keeps itself up to date within represented areas about significant innovative treatment options and evidence-based treatments. We have achieved a stable growth thanks to our good customers and partners trust and successful cooperation. 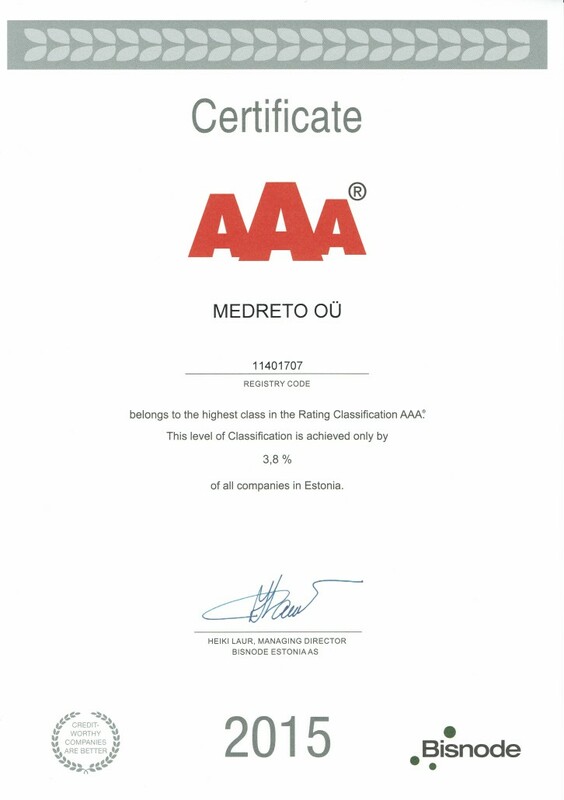 As a proof of this, Medreto Ltd received in two consecutive years from Krediidiinfo, a subsidiary of a leading global credit information group Experian, a credit rating AA – “very good”, and was recognized as a “Successful Estonian Company 2014”. At 2015 Medreto received a credit rating AAA- The highest possible rating assigned to the bonds of an issuer by credit rating agencies. The rating is an assessment of a company, expressed as a cumulative grade based on economic, financial and payment behavior. 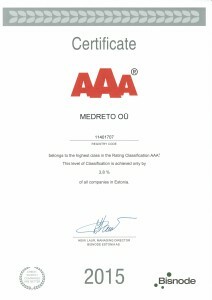 One of the main objectives of this attributed recognition is to confirm the reliability of Medreto Ltd to company’s customers and partners, for whom long lasting and sustainable business relationships are significant. 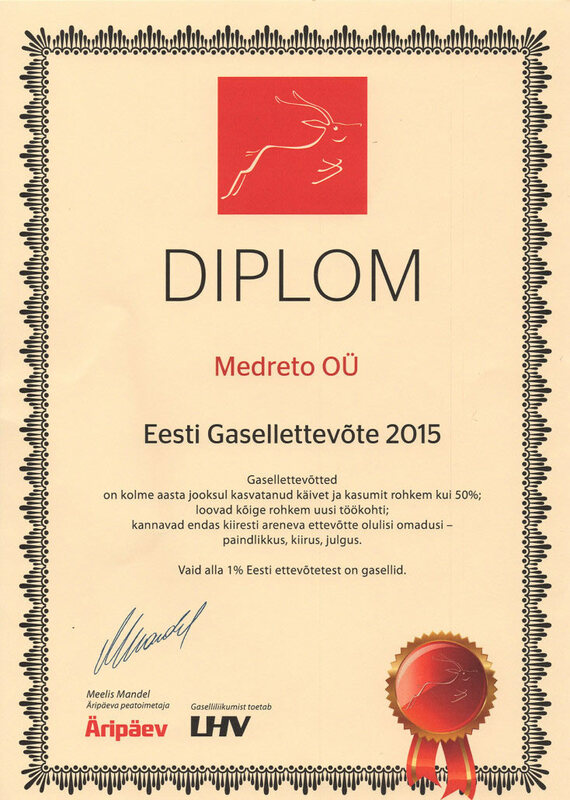 Medreto Ltd is awarded in 2015 and in 2016 with Gasell Diploma in Estonia. The Gasell Diploma in Estonia is given by Äripäev (our version of largest Business Newspaper) and LHV (a private bank). They monitor, analyze and summarize the results. All companies registered and active in Estonia, across all industries, local and international, in all shapes and sizes are included in the selection. 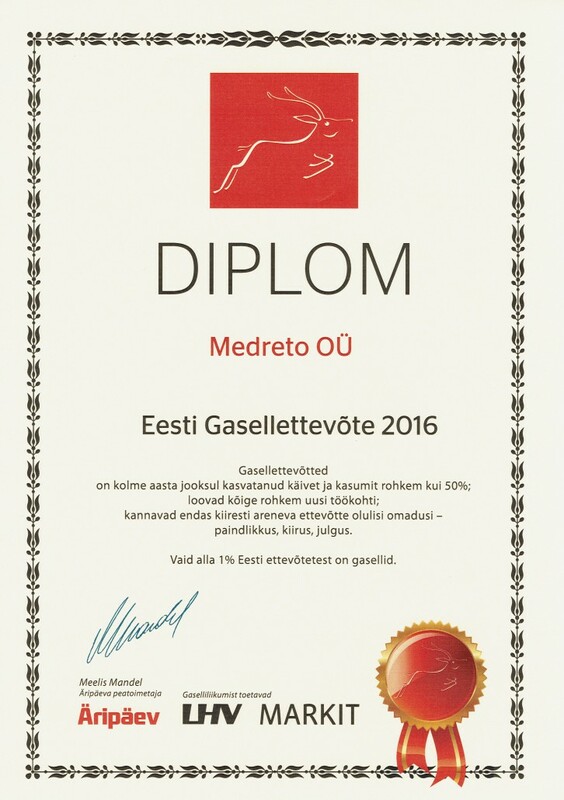 The Gasell Diploma is given to the most successful and sustainable developing companies. The companies have increased their revenue and profit by over 50% during the preceeding 3 years, created new jobs and carry within themselves the main key parameters of a fast developing company: flexibility, action speed and courage. 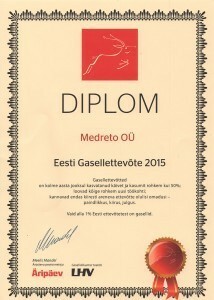 Only less than 1% of Estonian companies are Gasell companies.